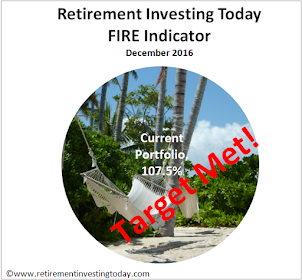 I currently hold 5% of my Retirement Investing Today portfolio in gold. This is in the form of physical ETC’s “which are intended to provide investors with a return equivalent to movements in the gold spot price less fees” available from the likes of ETF Securities. This is the commodities portion of my portfolio. I hold no other commodity types as the vast majority seem to be futures based and previous experience has taught me that issues like contango can really affect the available returns for the Average Joe. So let’s get down to the question posed in today’s post title. Is gold in a bubble? Well of course I have no idea but I’d be quick to also point out that nor does anybody else. What I can do though (as always) is analyse some data and make a few comments. I would then as always value your thoughts. At the time of writing this post gold was trading at $1526.90. That is a long way above the previous monthly nominal high in 1980 of $675.30 as shown in my first chart today. 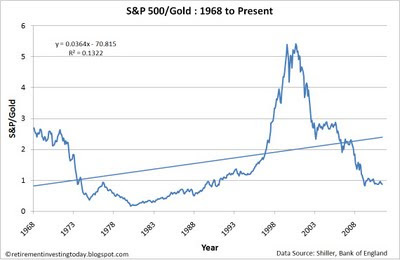 So if you were a vested interest you could trot this chart out and say gold is in a bubble. Of course though as regular readers will know in my humble opinion this chart is actually meaningless as it does not take into account the fact that a dollar today is worth more than a dollar tomorrow. 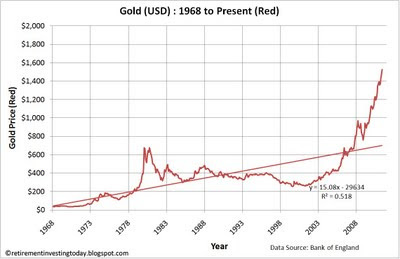 If we correct for that by adjusting for inflation we arrive at my second chart which is the real (inflation adjusted) price of gold. 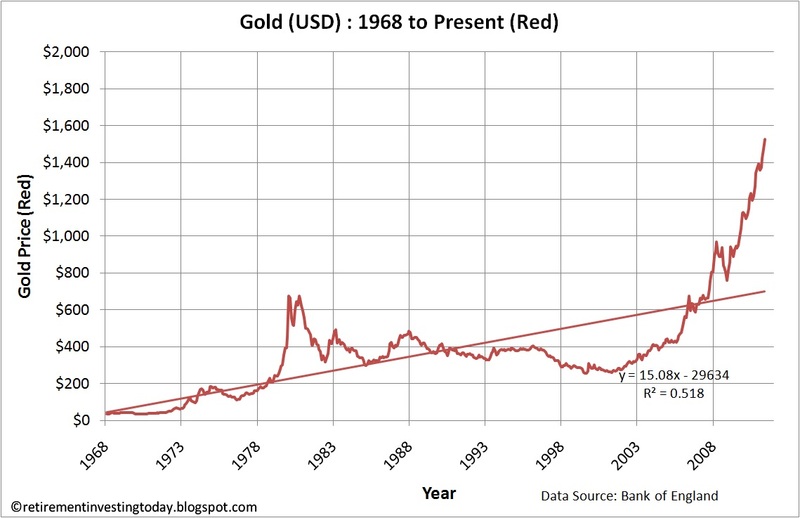 This shows that the price of gold in 1980 did not actually peak at $675.30 but instead actually reached $1977.14 in today’s dollars. So to reach a new real high the price still needs to appreciate by a further 29%. Of course at $1526.90 it’s a long way above the long run real average of $656.26 so is not cheap but it’s also a long way below being a new real high. I’ll just sneak in the usual key gold points now. The correlation between the Real S&P 500 (also displayed on the second chart) and real gold is now at -0.24. My third chart then provides the ratio of the S&P 500 to gold demonstrating just how far apart the two can vary. Today this ratio is 0.87 against an average of 1.61. So by this measure, as has been the case for some time, it would suggest that if you were looking to choose to buy the S&P 500 or gold then the S&P 500 might be the better option. 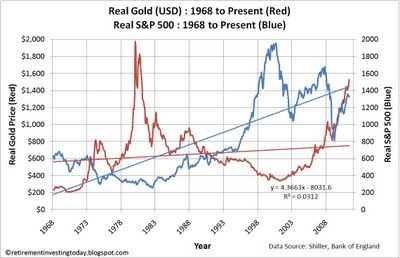 So that data would suggest gold is also certainly not cheap and actually may not give the best return of all the available asset classes going forward. Chinese investors don’t seem to think gold is in a bubble. In the first quarter of this year they purchased 93.5 tonnes of gold as reported in the Telegraph on page 18 this week (that’s deep into the paper and well after important articles like “Eating less red meat could save 17,000 lives makes me think this is not a shoe shine moment). That is more than double that of the same period of 2010. So at an average price of $1,384, more than twice as many tonnes were bought than at $1,108.90. That’s starting to sound like the classic investor buy high sell low phenomena or maybe it’s just that the Chinese are starting to become aware that their currency doesn’t buy what it used to and are looking at ways to protect that. What about other shoe shine moments? Well I’m still seeing plenty of cash for gold advertising. I’m also starting to see small stalls set up in shopping centres and arcades where there is nothing more than a table, a set of scales, a single person, a small sign and I assume some cash somewhere offering to buy my unwanted gold. That seems to me to be the wrong way around for a shoe shine moment. I would say the bubble is when we have exactly the same scenario but somebody is offering to sell you small ingots of gold as a “great investment”. 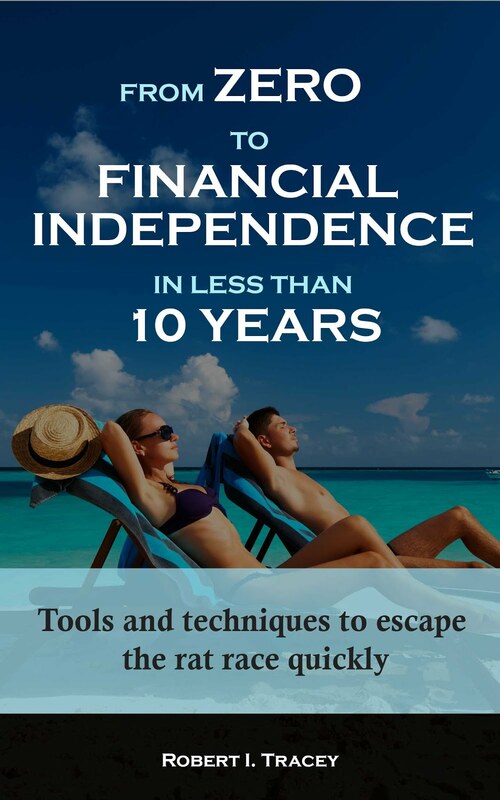 With Greece about to implode on its debt and lots of lovely inflation starting to happen as a direct result of the low interest rates and quantititave easing which our bankers have used to “fix” our problems I can also see the possibility (if it hasn’t already started) of inflation starting to embed itself. Of course our bankers want this as it erodes the debt of the many at the expense of the few however the few may soon catch on and start to look for ways to solve this problem. Gold may be one route they choose. Just to highlight the inflation analogy. If I annualise the last 3 months of published US CPI data inflation is 7.8% and for the UK annualising the last 3 months of RPI data inflation is 9.4%. So is gold in a bubble? Well the data above suggests it isn’t cheap but it also tends to hint that it may not be bubble territory either. Of course I’m not buying any as my strategy requires me to own 5% of my portfolio in gold which is where I am today. However that also means I’m not selling any either. - Last Gold price actual taken on the 27 May 2011 during trading. - Last S&P 500 price actual taken at market close on the 26 May 2011. - Inflation data from the Bureau of Labor Statistics. April and May ‘11 inflation is extrapolated. I think it's a bubble, but it may have quite a way still to run. If so, you will presumably be selling some to maintain your 5%, depending on other asset class performance. 1. New investment money to go in to worst performing asset class. 2. Dividends (where applicable) to be added to new investment money and then to go in to the worst performing asset class. I'm doing this rather than dividend reinvestment to hopefully pull money out of the "winners". 3. If the asset class varies by more than 25% either way from target then rebalance the asset class. 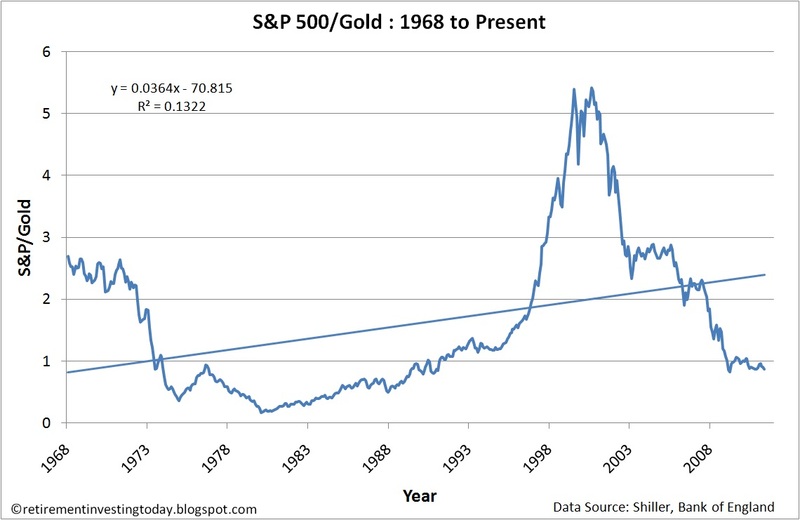 So in the instance of gold if it goes parabolic and reaches 6.3% then I'll be selling down. Conversely if it collapses and reaches 3.8% then I'll be buying. For all asset classes I'm hoping in the long run that by undertaking 1 and 2 I will only have to perform 3 very rarely. I have no idea if the strategy is right, only time will tell, however it "feels" more scientific than say a simple strategy of rebalance every year. A very clear strategy, but that is only what I would expect from you :-). Thanks for all your graphs, by the way.